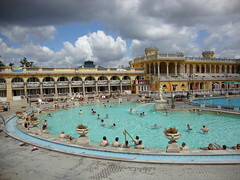 Szechenyi gyogyfürdo is one of the spas you can find in Budapest. 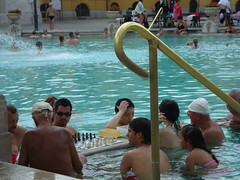 In fact, they are much more than spas, they are places you go to to chat with friends and family, to play checks or read a book in the water. 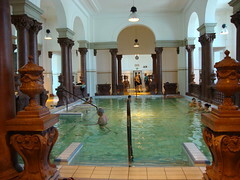 If I remember well, this one offers over 17 pools at different temperatures from 20° to 40°Celsius, with bubbles or without, with streams or without, as well as saunas and hammams. The atmosphere is very nice, not loud although it could be. Everything is very clean. They say it is even better in winter, with the snow all around and the outside pools around 30° (the water comes out naturally at 70°). This looks like too much fun. Did you step into any of the pools?? 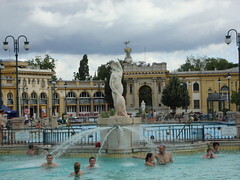 I've been to Budapest several times but never knew about the spas1! Awesome!! !